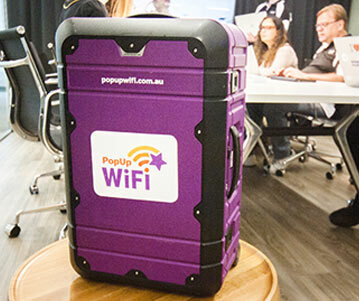 Win Best In Show when you hire managed conference internet from PopUp WiFi. How great would it feel to know that your conference internet was all taken care of? Internet fails aren’t just annoying – they can ruin the image of your conference, destroy your audience engagement plans and take the shine off the event that you’ve worked so hard to produce. If you’re planning to welcome delegates using tablets, wireless scanners or registrations kiosks, you’ll need solid internet. Likewise if you’re running a live conference app or beaming speakers in via video link. Live polling, virtual and augmented reality engagement all have the potential to rock your delegates’ world – until they don’t work. That’s why it’s worth bringing in the best. Let our team of expert network engineers design a custom network and manage your internet live during your conference. You’ll be able to focus on delighting your people, without worrying about the WiFi letting you down. 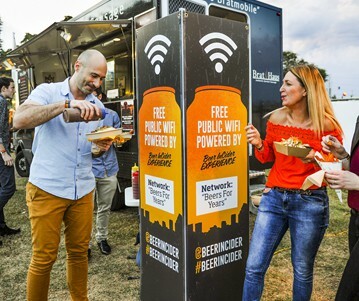 PopUp WiFi has provided WiFi to several hundreds of events across Australia and the US since 2014. Our conference clients choose our temporary internet because we create powerful, affordable solutions that are backed by friendly experts. We manage your network live, using tricky technologies to handle potential congestion or remoteness. Whether you’re thinking about internet for a few exhibitors or for a few thousand ticket holders, our temporary WiFi will make you look like a production rockstar. The Professional Conference Organisers Association reported that the two biggest complaints from delegates are about the catering, and – you guessed it – dodgy internet. Why not give your corporate partners the opportunity to provide excellent branded internet to your pre-qualified audience, collect some useful data and take the credit for protecting your delegates from the spinning wheel of doom. Talk to us about CAPTIVATE, the best way to take internet from an expense to a revenue source for your conference. The realestate.com Group knows how to keep people on the edges of their seats! 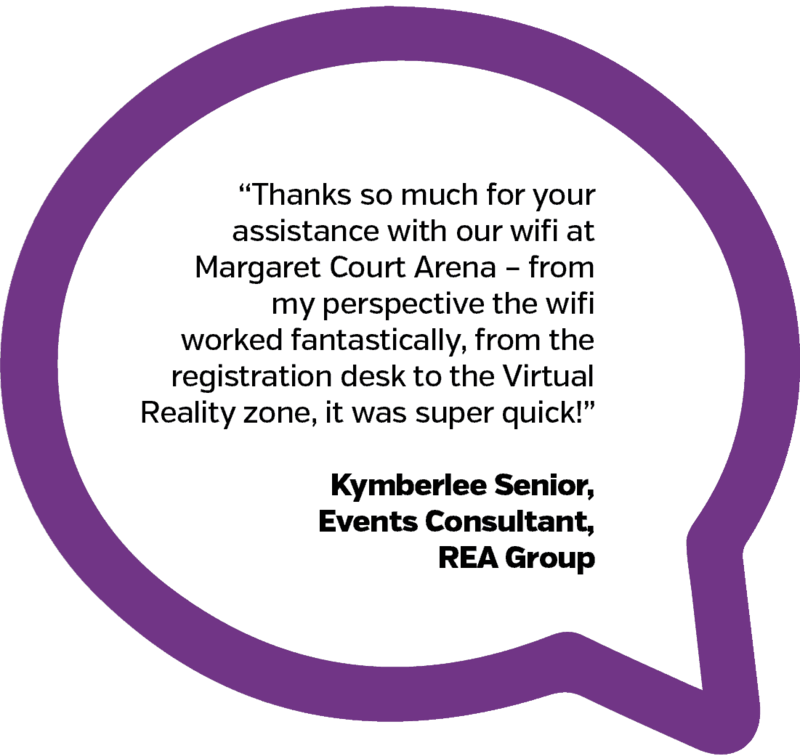 The Group took over the Margaret Court Arena to host a knowledge and culture-building extravaganza for 1,500 of their associates. The Global Kick-Off 2018 event blended large sessions with electrifying speakers, engaging individual experiences with cute robots, playing with Virtual Reality goggles and live interaction a go-go. To pull all of this off, the organisers needed rock-solid internet to run the show. 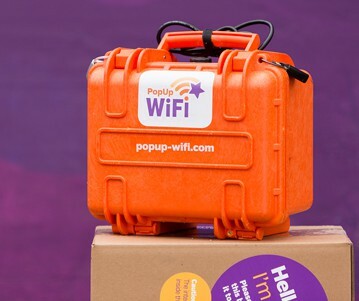 From smooth delegate registrations and easy access to the event app, to internet to keep the online activations looking gorgeous and delegate email flowing, PopUp WiFi had it covered. Being a distinctive brand, REA also called for custom branding for extra polish and pizazz. We worked with the client to devise a modular combination of branded towers and smaller units to place custom WiFi exactly where the event organisers needed it. A branded splash page and auto-redirect to the event website made for a cohesive branding experience that was consistent with every other detail of the conference, at a fraction of the price that their client thought they would have to pay.